This is my latest book. Its title is Out of the Shadows, Exposing the Power of Bible Women. God created women to have and use power. Most Bible women did not have formal power positions; yet they were powerful. Bible women used rational, social, and emotional influence techniques plus negative influence strategies. Some Bible women possessed and used “will power,” a mega-power technique. 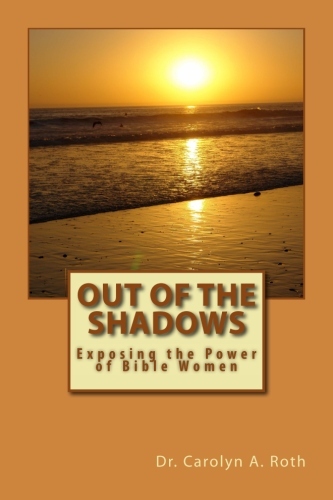 Out of the Shadows, Exposing the Power of Bible Women exposing and interprets the power and influence of Bible women. Some of these women we know and love; others we know and despise. When reading this book, women will nod their heads when Bible women’s behaviors are identified and interpreted. Men will remember when their minds and behaviors were changed by a woman’s words and actions. The numerous power sources and influence techniques used by Bible women change our concept of Bible women from chattels to women of power. This entry was posted in Uncategorized and tagged Carolyn Roth Ministry, Influence, Lesser Known Bible Characters, Obscure Characters, Out of the Shadows, power, Women Power. Bookmark the permalink.